Fully automated: Covers the entire sampling process from sample loading, barcode scanning, results reporting, LIS data transfer, and cartridge disposal. Multi-sample testing: Features a 20-sample capacity with continuous sample throughput capability. Affordability: The MultiPath analyzer is designed with value and performance in mind, and First Light tests offer labs a combination of high-performance and cost-effective testing capabilities. On-demand testing: A true “load and go” testing system that is walk up ready when you need it. Any test type at any time: A single cartridge design for the full menu of First Light tests. Touchscreen operation: An intuitive yet powerful software user interface provides a simple, flexible user experience. Connectivity: Supports bi-directional LIS connectivity, and USB ports for easy data transfer. The MultiPath platform is unique in its ability to rapidly perform a variety of tests at the same time using a universal cartridge for all First Light tests. 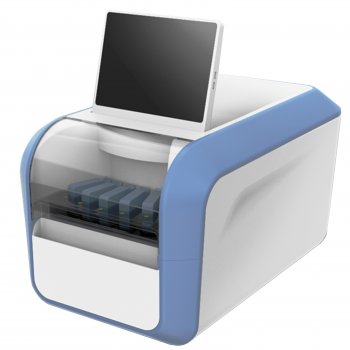 The random-access capabilities support a broad range of tests including pathogen identification, toxin and biomarker detection, and rapid phenotypic antimicrobial susceptibility testing …. at the same time…. on the same random-access platform.